Calling all Giants fans! Calling all Giants fans! It's finally here. The meetup between the Giants and the Patriots. This game is always a grudge match because it's New York vs Boston. 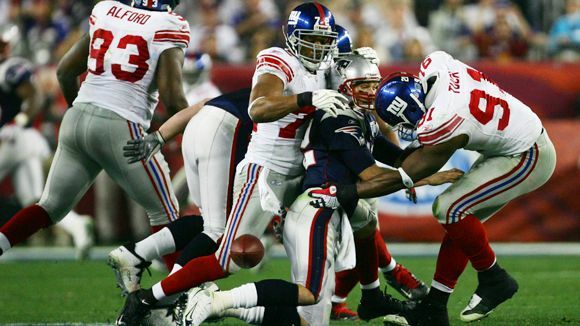 It's Giants vs "That 2007 Team That's Still Pissed Off". More importantly it's Giants FANS vs Patriots fans. Buffalo Joe's has recently become the home for the New England Patriots fans, as well as BigBlueDFW. In a game like this you want to have the bigger group of fans. That's where you come in. 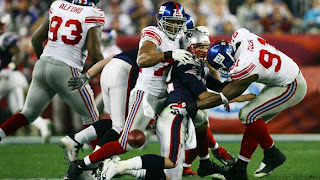 So come on out this weekend and watch the Giants front seven turn Tom Brady into the "human grass stain" once again. Game time is Sunday, Novemeber 6th at 3:00pm CST. Several Giants fans have spoken and said they'll be arriving around noon or sooner to hang out and watch other games. Hope to see you all there. As you know, it’s always more fun watching Giants games with other Giants fans.